The reckoning of New England IPAs is going to come. After years of the milkshake beer being the new kid on the block, trends are slowly switching back to old school pale ales and even hopped lagers. I don’t think the NEIPA will fully go away, but when every brewery jumps on the trend it just loses it’s panache. 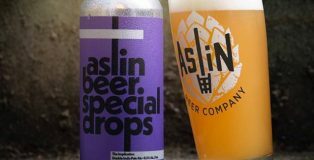 I thought I had tasted every kind of juice box imaginable … until trying The Implication from Aslin Beer Company.